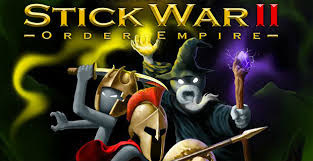 - Play Stick War 2 - Order Empire; the epic sequel to the hit strategy game Stick War! Many of the empires you previously controlled have rebelled - fleeing to the outskirts of their homelands. Their numbers have swelled, and under the leadership of the Magikill the rebels have become a dangerous threat to your Order Empire! Return to the land of Inamorta and unite the people under one banner... but beware, a new evil is in the air and you will not be able to face it divided!